A visit to the Civil War surgeon, often literally a “sawbones,” was a horror more feared than death on the battlefield. Safe behind its ocean barriers, the United States paid scant attention to the wars that raged abroad during the early 19th century, taking little notice of the lessons that might have been learned from the European experience with mass killing. With few opportunities for its own military medical establishment to acquire field experience, the U.S. Army’s military medical service remained primitive. In 1802, the U.S. Army Medical Corps comprised only two surgeons and 25 orderlies. By 1808, the number of surgeons had increased to seven and surgical assistants to 40. There was no ambulance corps during the War of 1812; after the battle wagons were sent to search for the wounded. There were no hospitals, either, and the wounded were treated in temporary shelters near the battlefield. Even these primitive facilities were dismantled when the war ended. In 1818, Congress finally authorized the appointment of Dr. Joseph Lovell to head the medical corps as surgeon general. At the start of the Mexican War in 1846, the American medical corps consisted of one surgeon general and 71 medical officers. Statistically, the Mexican War was the deadliest ever fought by an American army. Of the 100,182 soldiers committed to the campaign, 1,458 were killed in action and another 10,790 died of disease, a disease mortality rate of 11 percent. This compared to a similar rate of 6.5 percent for the Civil War, 2.7 percent for the Spanish-American War, and 1.6 percent for World War I. The single medical contribution of the Mexican War was the first use of anesthesia by a military surgeon in combat. The medical service was once more reduced in strength when the war ended. At the outbreak of the Civil War, no one on either side was remotely prepared for the magnitude of the slaughter, forcing both sides to endure a medical catastrophe that was unprecedented in military history. The Civil War was the first modern war in which the productive capacities of the industrial state were completely integrated into the war effort. The number of combat engagements was the largest in history to that time, and exponential increases in the killing power of weapons produced rates of casualties beyond the imagination of military medical planners. In a four-year period, 2,196 combat engagements were fought, in which 620,000 men perished—360,000 in the Union Army and 260,000 in the Confederate Army. 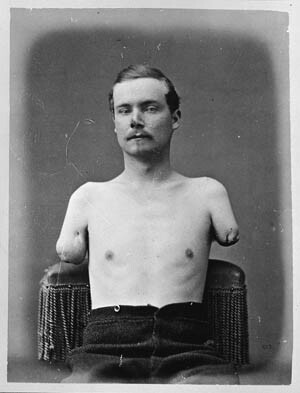 Some 67,000 Union soldiers were killed outright, 43,000 died of wounds, and 130,000 were disfigured for life, often with missing limbs; 94,000 Confederate soldiers died of wounds. The minie ball (actually a bullet) caused 94 percent of all wounds, artillery shell and canister accounted for 6 percent, and the saber and bayonet fewer than 922 wounds, of which only 56 were fatal. Some 35 percent of all wounds were to the arms, 35.7 percent to the legs, and wounds to the head and trunk accounted for 18.4 percent and 10.7 percent, respectively. In a statistical sense, the Civil War was the most life-threatening war ever fought. The chances of not surviving the war were one in four, as compared to one in 124 in the Korean War. The staggering increase in the number and seriousness of wounds was due to the .58-caliber rifle-barreled firearm, which was capable of propelling a bullet 950 feet per second to a range of 600 yards. The heavy, soft, unjacketed lead bullet flattened out on impact, producing severe wounds and carrying pieces of clothing into the wound. When the bullet struck a bone, its weight and deformation shattered the bone or severed it completely from the limb. The old tactic of massing troops to deliver mass fire, once made necessary by the inaccuracy and limited range of the musket, persisted, making troop formations extremely vulnerable to long-range rifle fire. The deployment of troops over greater frontages also increased the dispersal of the wounded, making it difficult to locate, treat, and evacuate them. The Civil War medical officer faced problems of wound management that were unique for the time. The improved kinetic power of the rifle bullet made amputation the most frequently performed battlefield operation. Of the 174,200 gunshot wounds to the arms and legs suffered by Union soldiers, 29,980 required amputation. Confederate soldiers suffered 25,000 primary amputations. The mortality rate for primary amputation was 26 percent, compared to 52 percent for secondary amputation. Another 26,467 wounds of the extremities that were complicated by an injury to the bone were treated by expectation (left alone to heal), with a mortality rate of 18 percent. More limbs were lost in the Civil War than in any other American conflict before or since. For the first time in history, anesthesia was used on an unprecedented scale by military physicians. No fewer that 80,000 applications of anesthesia were administered. General hospital records show that anesthesia was used in 8,900 operations, of which 6,784 used chloroform and 811 used ether. In 1,305 cases, a combination of the two was used. Remarkably, only 37 deaths were attributed to anesthesia. Advances were also made in the immobilization of limbs using plaster of Paris. In 1863 the famous Hodges splint, still used today in the fracture of the lower femur, was introduced by Union surgeon John Hodges. The use of drugs was primitive at best. Calomel (mercurous chloride) was so heavily prescribed that the Surgeon General forbade its use as dangerous. The most useful drugs were morphine, opium, and quinine, the latter as a preventative for malaria. Morphine was usually dusted directly on the wound, and only occasionally injected hypodermically. The hypodermic syringe appeared in the 1850s but was used only rarely in the Civil War—at least on the physically wounded. Dr. Silas Weir Mitchell noted that in the army hospital for nervous diseases, more than 40,000 doses of morphine were given hypodermically to psychiatric patients in a single year. A staggering 10 million opium pills were given to patients during the war, along with 2,841,000 ounces of other opium-based preparations such as laudanum, opium with ipeac, and paregoric. In all, 29,828 ounces of morphine sulphate were administered. Not coincidentally, by 1900 there were 200,000 drug addicts in America. A battlefield amputation is being performed at Gettysburg. Nearly 30,000 legs were amputated during the war by Union surgeons. Disease was the number-one killer of soldiers on both sides during the Civil War. Most recruits were physically unfit for the rigors of war. Three-quarters of the Union soldiers discharged from the army in 1861 were so unfit that they should never have been allowed to enlist. Most recruits came from isolated rural towns, and this isolation prevented them from developing immunity to a wide range of common childhood diseases. Being brought together in the close quarters required of military life, many fell ill with diseases to which they had never previously been exposed. Poor physical condition, few immunities, poor nutrition, and the general stress of military life reduced resistance to disease. Scurvy was endemic, and outbreaks of cholera, typhus, typhoid, and dysentery took a heavy toll. Disease killed approximately 225,000 men in the Union Army and 164,000 men in the Confederate ranks. It is estimated that disease killed five times as many men as weapons fire. The Union medical service was completely unprepared for war. In 1860, the 26,000-man army was scattered along the frontier and had no military medical service to speak of. The army had only 36 surgeons and 83 assistant surgeons, 24 of whom resigned to join the Confederacy. Medical supplies were in short supply, and there were no army general hospitals. There was no ambulance service to locate and evacuate the wounded. The incumbent surgeon general was Thomas Lawson, a sick and dying man who economized on expenditures by refusing to purchase medical books and supplies. In the 1850s, then-Secretary of War Jefferson Davis had ordered two officers, one of whom was Captain George B. McClellan, to prepare a study of medical lessons learned from the Crimean War. The report recommended the creation of an army ambulance corps. But by 1860, no such corps had been established. For the first two years of the war, there were no systematic provisions to evacuate the wounded. At the Battle of Bull Run, wagons had to be commandeered from the streets of Washington to transport the wounded. In the Peninsular Campaign, a Union Army corps of 30,000 men had ambulance transport sufficient for only 100 casualties. At the Battle of Wilson’s Creek, Missouri, in August 1861, the wounded could not be moved for six days due to the lack of ambulances. In November of that same year, Brig. Gen. Ulysses S. Grant abandoned his wounded at Belmont, Missouri, because there were no ambulances. In 1861, Lawson was replaced by Dr. William Hammond, who appointed Dr. Jonathan Letterman as surgeon general of the Army of the Potomac. Letterman immediately set about creating an ambulance corps. Each army corps now acquired its own organic medical transport. Each division, brigade, and regiment had its own medical officer who answered to the corps’ medical officer responsible for coordination at all levels. The chief surgeon within each division controlled the ambulance corps. Each regiment was assigned three ambulances and a complement of drivers and litter-bearers, and each division had its own ambulance train of 30 vehicles. The ratio of ambulances to men averaged 1 to 150. Only medical personnel were permitted to remove the wounded from the battlefield, a regulation designed to reduce the manpower loss that often resulted when several men left the line to transport their wounded comrades to aid stations. Ambulance wagons were removed from control of the quartermaster and used only for medical transport. They were posted near the front of the column to be within easy reach once a battle began. The first test of Letterman’s ambulance system came at the Battle of Antietam in September 1862. Union forces alone suffered 10,000 wounded scattered over a six-mile area. The system reached and evacuated most of them within 36 hours. A month later at Fredericksburg, the system worked so well that the wounded piled up at aid stations faster than they could be treated. Within 12 hours, all 10,000 wounded had been located, transported, and cleared through the aid stations. Letterman’s ambulance system was integrated into the larger network of casualty evacuation from field hospitals at the front to general hospitals in the rear. Railroads evacuated casualties from collection points behind the battlefields to the general hospitals. By the end of the war, Northern railroads had transported 225,000 sick and wounded men from the battlefields to the general hospitals. The Union medical service also used coastal steamers and river steamboats under the control of the medical corps to transport the wounded. In 1862, the Union Army contracted for the use of 15 steamboats on the Mississippi and Ohio Rivers and 17 seagoing vessels for use along the Atlantic coast. In the last three years of the war, 150,000 casualties were transported by boat to the general hospitals. The first use of a hospital ship was at the Battle of Fort Henry in February 1862, when the City of Memphis transported 7,000 casualties to hospitals along the Ohio River. Also in 1862, the navy purchased the D.A. January as its first hospital ship. By the end of the war, January had transported 23,738 casualties on the Ohio, Missouri and Illinois rivers, with a mortality rate of only 2.3 percent, significantly lower than the rate in land-based hospitals. The first naval nurses in America, the Catholic order of the Reverend Sisters of Mercy, served aboard Red Rover, tending the wounded after the siege of Vicksburg, Mississippi. In March 1862, Hammond recommended that all Union armies adopt Letterman’s system, which until then had been limited to the Army of the Potomac. Congress approved the recommendation in March 1864. It was only at the end of the war, however, that Letterman’s reforms were fully implemented. 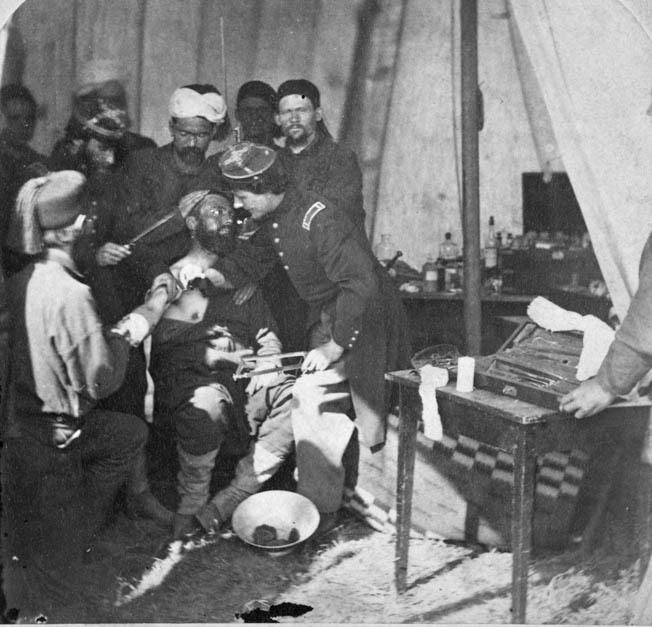 Zouave soldiers prepare an injured comrade for the amputation of his right arm while surgeons stand by with their instruments. Letterman also changed the structure of the field hospital system by turning regimental hospitals into frontline aid stations. Treatment of the wounded at these stations was limited to control of bleeding, bandaging wounds, and administering opiates for pain. This allowed medical officers to hold the slightly wounded there and return them to the line, reducing manpower loss due to needless evacuation. Behind the aid stations, Letterman created mobile surgical field hospitals. These hospitals were the critical link between the frontline aid stations and the rear-area general hospitals. The system was tied together by the field ambulance corps, railways, and hospital ships. The general hospitals were located in major cities along established water and rail routes. By 1862, a building program was undertaken in the North to construct additional hospitals. A year later, the Union Army had 151 general hospitals with 58,715 beds ranging in size from small facilities of 100 beds to the Mower General Hospital in Philadelphia with 4,000 beds. Some of these hospitals became treatment centers for medical specialties such as orthopedics, venereal disease, and nervous disorders. St. Elizabeth’s in Washington, D.C., became the first military psychiatric hospital in the country. Another of Letterman’s innovations was the establishment of a modern medical supply system that worked well under field conditions. Until this reform, medical supplies and equipment were obtained from the quartermaster through the usual supply system. This often led to medical units not receiving adequate supplies. Letterman established basic medical supply tables, equipping all medical units from regiment through corps with basic loads of medical provisions. Each unit was to carry with it supplies for 30 days. A medical purveyor accompanied the army and was responsible for continually replenishing the medical supplies of each unit. Most surgeons in both armies were commissioned by state governors to provide medical support for the regiments raised by the states. With few standard licensing procedures for medical certification, it is not surprising that basic competence was a major problem. Few of the physicians entering the state regiments had surgical training. As the war dragged on, however, many of the marginally competent physicians and surgeons became excellent practitioners as a result of their battlefield experience. About 13,000 physicians and surgeons served with the Union Army. Of these, 250 Regular Army surgeons and assistant surgeons were appointed by Congress to serve as staff and administrators. Some 547 brigade surgeons were commissioned by Congress to assist the corps of regular surgeons. Another 3,882 regimental surgeons and assistants were appointed by governors to state regiments. These surgeons usually served in the aid stations and mobile field hospitals. The army hired 5,532 contract surgeons, mostly civilian doctors, to staff the general hospitals. An additional 100 doctors staffed the Veterans Corps to provide aid to the disabled, and 1,451 surgeons and assistants served with the 179,000 Black troops in 166 regiments. One of the Union surgeons was Mary Edwards Walker, the first woman in American history to hold such a position. Women mostly served as nurses, however. In the North, 3,214 female nurses served in military hospitals under the control of Dorothea Dix, who had been appointed as superintendent of Women’s Nurses. One of Dix’s nurses, Clara Barton, went on to found the American Red Cross. The special place of women in Southern culture militated against using women in military hospitals. Consequently, female nurses were not used there on a large scale. With the end of hostilities, the Union Army was demobilized and along with it the military medical service. By the end of 1866, the Union Army had been reduced to a force of only 30,000 men. The army and its skeleton medical corps were scattered among the 239 military posts throughout the country. By 1869, the entire medical service corps consisted of only 161 medical officers. Most military posts had no surgeons at all, and they were forced to rely on contract physicians for medical support. Only 282 surgeons were available to the military. Letterman’s system for dealing with mass casualties disappeared virtually overnight. In general, the Confederate medical service was organized and operated very much like the Union system, although it suffered more from shortages of personnel and equipment that magnified its shortcomings. The total number of medical officers in the Confederacy was 3,236, of which 1,242 were surgeons and 1,994 assistant surgeons. The Confederate naval medical corps had only 107 medical officers, including 26 surgeons and 81 assistant surgeons. The South’s shortage of physicians was to some extent self-inflicted. For reasons that remain unclear, all medical schools in the South with the exception of the University of Virginia were closed at the start of the war, cutting off the Confederate armies from an invaluable source of trained medical personnel. Moreover, the Confederate surgeon general established unrealistically high qualifications for physicians wishing to join the medical service, causing still more shortages. Worse yet, he examined those physicians already in the medical corps for competency, forcing significant numbers to resign. The Confederacy was never able to provide adequate numbers of surgeons and other physicians to deal with the heavy casualties it suffered on the battlefield. The Confederate ambulance service was never adequate and suffered from a chronic shortage of wagons and other transport. In 1863, Confederate medical officers complained that there were only 38 ambulances in the entire Army of the Mississippi. The situation worsened as the war continued. In 1865, not a single ambulance could be found in the combat brigades of the armies of West Virginia and East Tennessee. The shortage of ambulances forced the South to make greater use of steamboats and railroads to transport its wounded. But the undeveloped nature of the Southern railroad system resulted in a shortage of efficient track routes over which to transport casualties. Small 100-bed hospitals were constructed at rail junctions to deal with the problem. Shortages of vital medical supplies plagued the South until the end, including shortages of quinine and anesthetics. Paradoxically, these shortages sometimes produced beneficial if unexpected results. It had been the common practice on both sides to cleanse wounds with sea sponges kept in buckets of water next to the operating table. Squeezed in dirty water and used repeatedly, these sponges became major sources of infection transmission. The shortage of sponges in the South as a result of the Union blockade forced Confederate surgeons to use cotton rags instead. Since the rags were used only once, disease transmission was reduced considerably. The used rags were recycled, a process that required them to be washed, boiled, and ironed, and thus made sterile. Bandages, too, were better in the South since they were made of cotton that had first to be baked to be made useable. It had been common practice to use harness-maker’s silk for ligatures and sutures. With no silk available, Southern surgeons used horsehair instead. To make horsehair pliable enough for suturing, it first had to be boiled. Boiling made the suture material sterile. The South recognized dentistry as an important medical specialty. As secretary of war before hostilities broke out, Jefferson Davis had tried to convince the army to establish a separate dental corps, but had failed to do so. The South had a more comprehensive dental care program than the North, which contented itself with transferring to the artillery any toothless soldiers who could not bite off the ends of their cartridge packets. The Confederacy’s general hospital system was perhaps the only element of the military medical service that was somewhat equivalent to the system in the North. The largest hospital on either side was the 8,000-bed Chimborazo Hospital outside of Richmond. With 150 single-story pavilions organized into five divisions, each with 40 to 50 surgeons and assistant surgeons per division, it was the largest military hospital ever built in the Western world. The pavilion-style hospital proved to be the best design for reducing infection by improving ventilation and isolation. These hospitals consisted of a series of long, single-story buildings isolated from each other. High ceilings with vents at the top and sufficient windows provided ventilation. Usually connected to a central semicircular corridor, these 60-patient buildings were sometimes unconnected, providing excellent isolation for disease wards. The pavilion-style hospital is generally credited to Dr. Samuel Moore, the Confederate surgeon general, who supposedly got the idea from British hospitals used in the Crimea. In fact, the design is actually much older and reflects the design of legion camp hospitals used by the Roman medical service. One of the more significant military medical contributions of the South is attributed to Lt. Gen. Thomas “Stonewall” Jackson. In 1862, Jackson ordered all Union medical officers held by his command to be released and henceforth treated as noncombatants. By June of that year, both Lee and McClellan agreed to a similar practice. Medical personnel were no longer to be subject to capture. If taken, they were to be allowed to treat their wounded and immediately released. All medical personnel held in Union and Confederate prison camps were freed in 1862, and exchanges of captured medical personnel continued until the end of the war. Jackson had instinctively anticipated the regulations dealing with medical personnel that were adopted by the First Geneva Convention a few years later. pension system was chosen over the asylum system of permanent care because it provided the disabled soldier with more freedom and mobility. For the first time an accurate medical records system was created that made it possible to track casualty records for every soldier. One consequence was the publication of the massive Medical and Surgical History of the War of the Rebellion, which remains the standard against which all such works are judged. The Civil War saw the development of the first effective military medical system for dealing with mass casualties, including aid stations, field and general hospitals, ambulance and theater-level casualty transport, along with an effective staff to coordinate it. For its time it was the best military medical system ever deployed, and it remained a model for other countries for decades. The introduction of the pavilion-style hospital was so effective in reducing disease mortality that it became the standard design for both military and civilian hospitals for the next 75 years. Wide use of anesthesia, primary amputation, the splint, and debridement (cutting away dead tissue) were the first effective methods of wound management in the modern age. These techniques, taught to thousands of physicians through hard experience, were carried back to civilian life, elevating the general level of medical care available to the nation as a whole. The prevalence of facial injuries encountered during the war stimulated the development of the new medical specialty of plastic surgery. Civil War surgeons performed six reconstructions of the eyelid, five of the nose, three of the cheek, and 14 of the lip, palate and other parts of the mouth. Dr. Gordon Buck performed the first total face reconstruction in history. Joseph Woodward, another war surgeon, became the first person to link the new technology of the camera to the microscope, and he published the first microphotographs of disease bacteria. He is also credited with the technique of using analine dyes to stain tissues for microscopic analysis. The advent of microphotography served to make the American military medical establishment receptive to the germ-fighting discoveries of Pasteur and Lister when they came along a few years later. Despite the terrible slaughter and suffering that it caused, the Civil War ironically marked one of the most progressive periods in the history of military medicine. That it came at a cost of hundreds of thousands of ruined lives and shattered families goes without saying. Tags Ambulance, Army of the Mississippi, Army of the Potomac, Battle of Antietam, Battle of Bull Run, Battle of Wilson's Creek, Clara Barton, Claude Étienne Minié, combat medic, Confederacy, Crimean War, Dorothea Dix, Fredericksburg, general george mcclellan, Gettysburg, Jefferson Davis, John Hodge, Jonathan Letterman, Mexican-American war, Peninsula Campaign, Spanish-American War, Stonewall Jackson, Ulysses S. Grant, Union Army.